a ravenous tiger tore out the living heart, which he laid on the plate." One of the best adventure games last year was without a doubt Broken Sword from Revolution Software in the UK. Also known as "Circle of Blood" in USA, "Chevaliers de Baphomet" in France and "Baphomet's Fluch" in Germany, this wonderful game had the merits to conjugate beautiful graphics and a simple interface with a thrilling story line that literally captured the attention of thousands of gamers. 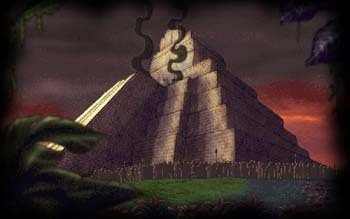 The explanation of this success might lie in the fact that, contrary to most other adventure games, Broken Sword was based on real historical details which, when added to fictional elements, brought an interesting and original scenario to the players. Instead of zany characters plunged into an out-of-this-world universe, the heroes of Broken Sword were simply ordinary people that destiny had placed in extraordinary circumstances. This could have been the kind of adventure that players would have experienced in the their own lives, or at least something that could have been found in a good adventure book or movie. 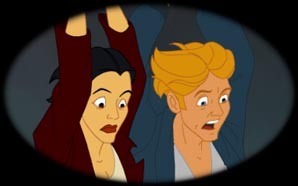 Broken Sword 2 will be no different. 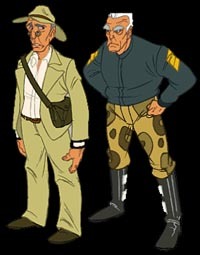 The game's plot takes its roots in the Mayan civilization and is set at the present date with the main characters, George and Nico, caught once again in a twisted adventure that will go far beyond their imagination. The story begins approximately six months after the end of the Neo Templars affair, in which George and Nico unveiled a conspiracy lead by a group claiming their cultural inheritance from the Order of Templars. George had to leave Paris for America, and subsequently leave Nico alone to take care of his father who was seriously ill. It was only after he died a few months later that George had the occasion to return to the French capital and see Nico again. However, six months had passed since, which gave Andre Lobineau, Nico's ex-boyfriend, plenty of time to replace George in Nico's heart. That of course, explained why Nico was so uncommunicative with George when he arrived in Paris. Instead of the celebration he was looking for, Nico brought him with her to the house of the famous French archeologist, Professor Oubier, with whom Nico had an appointment. Unfortunately, things turned out in a way that neither George or Nico had expected. Brutally knocked out by what looked like a Central American Indian, George was left attached to a chair with the company of a frightening tarantula, while the room was set on fire. From what George had last seen, Nico had been shot by a poisonous dart and taken away by the impressive Indian. Thus starts Broken Sword 2, which promises players a tremendous adventure with even more puzzles and dangers than the first episode. What made Broken Sword easy to play was its intuitive interface. In Broken Sword 2, it has been slightly altered, but keeps its simplicity and functionality. There are only three icons left, a pointing arrow, mouth and hand; the first used to interact with objects and characters (i.e. open a door, give an object to a character, activate a mechanism, etc...), the second to talk, and the third to point out exits and objects that can be taken into your inventory. 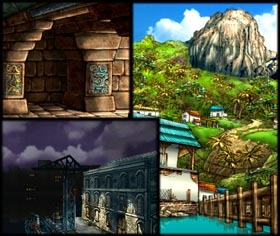 Players familiar with the original game will notice that the "moving gears" icon, which was a clue of a possible interaction between objects and elements of the background, has disappeared in Broken Sword 2. Most of the actions during the game are therefore resumed to left and right clicks. Left click to select an object from the inventory, placed at the bottom of the screen, and then move it where it is supposed to interact with, and right click for a closer look or a supplement of information about any objects or characters you have positioned your cursor on. In terms of graphics, Broken Sword 2 offers new technical advances to enhance the realism of the various places to explore. Alpha-blending, for example, has the effect of anti aliasing the outline of the characters which perfectly blends the sprites with the background. Shadows and transparency will give 16 levels of translucency to accurately render the visual effects that affect characters when they enter into the shadows, go through smoke, or pass behind glass or any other translucent materials. During horizontal scrolling, depth perception will be created through parallax layers with multi panning as in Broken Sword, but with even more layers. Additionally, geometric sprite transformation avoids pixellisation when the size of the characters are modified on the screen, and cinematic sequences boasts noticeable improvements in quality, although they were already excellent in Broken Sword. Unlike its predecessor, Broken Sword 2 is a Windows 95 native application, which with the help of the latest version of Microsoft's DirectX (5.0) will allow the game to move at a faster pace. Those who appreciated the various countries visited in Broken Sword (France, Syria, Spain, Ireland, Scotland), will be glad to hear that the sequel will continue this trend. From Paris to Marseilles, Quaramonte City in Central America to the Caribbean, the heroes of Broken Sword 2 will travel extensively and meet many characters of which several had returned from the first adventure, such as Mr. and Mrs. Henderson and Inspector Moue. All won't be as friendly though, and the drug dealer Karzac and his handyman, Pablo, are fine examples of the threat that await George and Nico in their odyssey. What danger lurks in the heart of the Mayan pyramid? The game is still in the beta testing phase for the moment, but if everything goes as planned, it should become available in September on two CD's. Not only will it enrapture the thousands of players that have been waiting for the sequel since the very first minutes of completing Broken Sword, but it will also be an excellent investment for the other adventurers who missed the first episode. Broken Sword 2 will most likely be THE point-and-click adventure game of the year, competing directly with LucasArt's Curse of Monkey Island for the title. There is one certitude though, never before in the past has another adventure game of this kind been so realistic. It is this level of realism, combined with polished graphics and a well crafted intrigue that will place Broken Sword 2 over the top. Click here for an exclusive Win 95 backdrop featuring Broken Sword 2. For more information, check out Revolution Software's website.